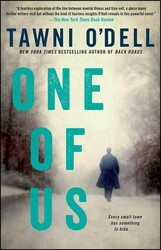 Tawni O’Dell, author of One of Us, discusses that incomparable moment when you receive the finished product of months and months of labor in hand. The awe, the pride, the fear, the excitement–read about all this and more below, and pick up a copy of One Of Us, now on sale from Gallery Books! I’m certainly not the first writer to stumble upon the idea that we tend to think of our novels as our children but the feeling had never hit me so strongly before. I held in my hand the end result of three years of my life, two years of grappling with characters and plot lines, agonizing over words and imagery, struggling with back stories and dialogue. Then another year fine-tuning, doing last minute rewrites and tedious editing, discussing marketing strategies and cover designs, and the worst task of all, waiting. Now was the time for celebration but I was alone. My children were both grown: my daughter recently graduated from college and off living her life; my son home from college but hanging out with friends at the moment. I was divorced for the second time and not currently involved with anyone. I had family and friends I could call, and I would eventually, but it wasn’t the same as having someone with you when you paged through that first book. After my daughter was born, I found myself alone, too. I was allowed to hold her briefly before the nurses whisked her off to be bathed and inspected. The doctor left, too. My husband, already displaying some of the qualities that would lead to the eventual dissolution of our marriage, gave me a perfunctory pat on the arm, told me I did a good job, and followed the delivery room entourage out of the room on his way to get a sandwich. A surreal feeling came over me as I stared outside at the beautiful summer afternoon and thought about the amazing feat I had just accomplished, but I could almost believe I hadn’t done anything at all since the evidence had been removed along with anyone to praise me. I had made a human being, I told myself. I had just expelled an eight-pound person from my body after ten hours of natural childbirth. That’s right. No drugs. Not one. I was a superwoman. A she-beast. And I was sitting all alone with a Sprite and an abdomen that still looked alarmingly large. No bands played. No confetti wafted down from the ceiling. No one gave me a medal. But despite all the well-meaning advice and the tender loving care you receive from some, in making a novel as in making a baby, you’re basically on your own. You have the final say. It’s your body; it’s your talent. You decide if you’re going to take good care of that growing child inside you; you decide if you’re going to rewrite that argument on page 124 between the two teenage brothers or just let it read like a script from an old ABC Afterschool Special. You make the choice to either try to create to the best of your ability or to simply gestate. Writers like mothers create for themselves. Being a mom is the hardest job out there. We make enormous sacrifices for our children but think about it: what is more selfish than making a mini-you, than giving yourself the greatest love of your life? Being a writer is a hard job, too, but we have readers, people who love our work, who wait eagerly for the next book. We have agents and teams at publishing houses that stroke our egos. We have reviewers who praise our work and reporters who line up to ask, “Where do you get your ideas?” All of this helps to make the effort worthwhile but nothing beats the personal satisfaction of holding that new book in your hands and knowing: I made this. My fifth literary offspring left the nest last week and went out into the big, bad world and as with my flesh and blood children, I worry about it every day. I wonder who it’s meeting, how it’s behaving, what others are thinking about it, if it’s in danger, if it’s ever going to earn any money. I also extend to it the same wish I have for my son and daughter: I hope the world will be kind. Liked Gone Girl? Then you'll love this fast-paced literary thriller about a forensic psychologist forced to face his own demons after discovering his small hometown terrorized by a serial killer, from the New York Times bestselling author of Back Roads.